The time that Robert Frost and his family spent on the farm in Derry in the early 1900s was a great source of inspiration to him. We can see a strong Derry influence in references to botany, farming, observational astronomy and the arrival of new technology, especially in his early poems. He wrote about the flowers and trees on his farm, as well as the animals – both wild and domesticated. The dark nights in the days before electricity sharpened his skill as an amateur astronomer. And Frost not only witnessed the arrival of modern technology, such as the telephone, but he wrote about it as well, incorporating it to great effect in his poetry. Using family letters, journal entries, contemporaneous newspaper accounts, and content from books that Frost owned or read, I will reveal the back stories of several famous poems such as “Mending Wall,” “After Apple-Picking,” and “Star in a Stone Boat” and less well-known poems such as “The Parlor Joke,” “In the Long Night,” and “Dear Louis.” We will see that Frost remained true to his declaration not “to write anything I don't see." Dr. Virginia F. Smith is a Professor of Chemistry at the United States Naval Academy where she maintains an active research program and has published over twenty scientific articles. 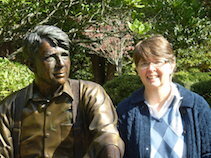 Her interest in Robert Frost's use of scientific imagery and language has led to three publications and multiple speaking engagements at colleges, universities, and professional meetings. She has also served as president of The Robert Frost Society. After earning an A.B. in physics and chemistry from Mount Holyoke College, Virginia served five years on active duty in the U.S. Air Force, then worked in industry before earning a Ph.D. in biochemistry from Washington State University. Virginia and her husband live in Annapolis, MD. Her book A Scientific Companion to Robert Frost is being released by Clemson University Press this summer.